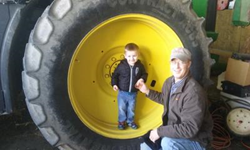 Army veteran Jed Welder and his wife returned to Michigan in 2008 to start a farm and a family. Having a lender that works with me, that knows my farm and the challenges I face, is more important than ever. Farm Credit Services of America CEO Doug Stark testified about the importance of Farm Credit’s broad mission to serve rural communities and agriculture and how Farm Credit is working with customers during the current downturn in the agricultural economy. The Committee also heard from Michigan farmer and U.S. Army veteran Jed Welder, Farm Credit Administration board members Kenneth Spearman, Dallas Tonsager and Jeffery Hall, along with representatives of the commercial banking industry. In addition to those testifying in-person today, nearly 80 groups representing farmers, ranchers, farmer-owned cooperatives and other agribusinesses, rural infrastructure providers and rural communities submitted statements for consideration by the committee. Similar to the producers Farm Credit serves, the System has built financial strength in anticipation of the economic cycle through diversification in loan geography, industry and size. Low commodity prices coupled with high input costs are putting pressure on farmers and ranchers. Farm Credit has been working to make sure its customers have accurate information about the situation and are able to make good business decisions. Helping to somewhat offset the current price squeeze, debt-to-asset ratios on U.S. farmers are below the 30-year average and well below the levels seen in the mid-1980s. Also in contrast to the devastating downturn agriculture experienced 30 years ago, interest rates—and therefore debt costs—remain low. “Farm Credit’s philosophy on credit today is this: we know our customers well, understand and respond to their needs and work cooperatively with them to analyze and structure our transactions to give them the best chance to succeed,” said Stark. Farm Credit is well known for its mission providing financing to all types of U.S. farmers and ranchers. In addition, Farm Credit’s agricultural mission includes financing aquatic producers, many farmer-owned cooperatives and other agribusinesses, and U.S. agricultural exports. A constant supply of credit to these areas has helped make agriculture one of the driving engines for the U.S. economy and allows U.S. agricultural producers to feed the world. Farm Credit’s mission beyond agriculture is just as important. Rural homebuyers face obstacles unknown in more urban settings and Farm Credit provides loans tailored to these unique circumstances. Farm Credit also provides financing for companies that provide vital infrastructure to rural communities, helping bring clean water to rural families, reliable energy to farms and rural towns, and modern, high-speed telecommunications that connect rural America to the rest of the world. Modern infrastructure makes rural communities competitive, provides jobs, and helps improve the quality of life for rural families. The complete hearing can be viewed at http://www.agriculture.senate.gov/hearings. Farm Credit supports rural communities and agriculture with reliable, consistent credit and financial services, today and tomorrow. Farm Credit has been fulfilling its mission of helping rural America grow and thrive for a century by providing farmers with the capital they need to make their businesses successful and by financing vital infrastructure and communication services. For more information about Farm Credit please visit http://www.farmcredit.com.